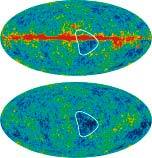 Are There Cosmic Microwave Background Anomalies? 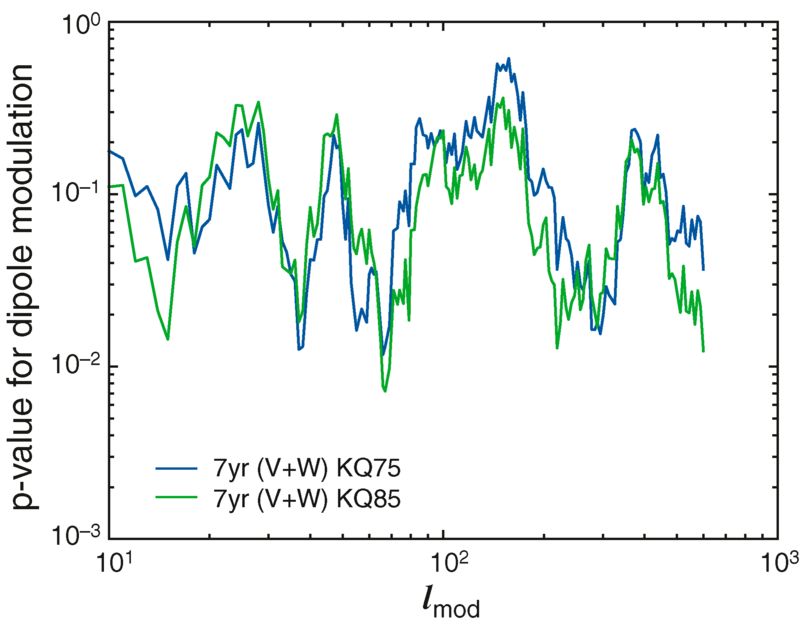 WMAP Seven-year Paper Figures, C. Bennett, et al. (top) A large colder than average region, highlighted by the white curve, appears prominently on the raw V-band temperature map. The full sky map is shown with the Galactic plane horizontal across the center of the map with the Galactic Center at the center of the displayed projection. (bottom) With the foreground signals strongly suppressed by the ILC technique, the highlighted cold spot is seen to be at least as prominent. It is offset from the Galactic Center in both latitude and longitude. 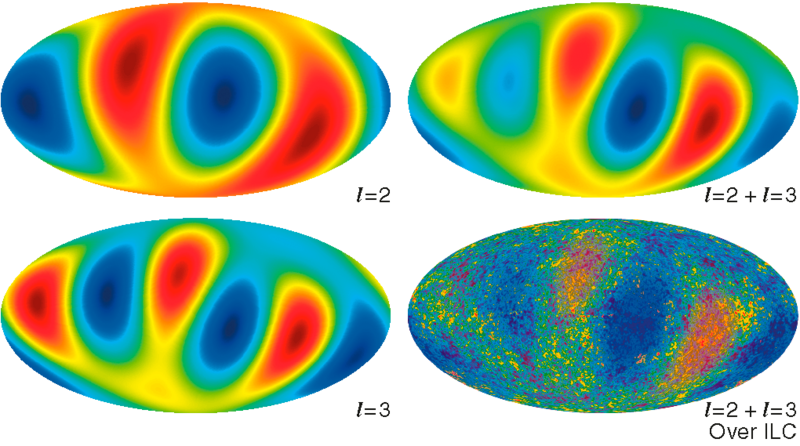 This fact, combined with the fact that the clearly effective ILC foreground reduction does not diminish this feature, establishes that this is a CMB fluctuation and not a foreground effect. This feature is not anomalous in that simulated realizations of ΛCDM model skies routinely produce features like this. A visual inspection of the ILC map reveals four elongated valleys of cooler temperature that stretch from about the Galactic equator to nearly the south Galactic pole. Ridges of warmer than average temperature lie between the cooler fingers. These features are a consequence of large scale power in the southern sky. It is more difficult to discern as much large scale power in the northern sky. Cold Spot I is located near the northernmost part of one of the fingers, while Cold Spot II (within the red curve) is near the southernmost part of another finger. The curve is a Blackwell-Rao estimate of the relative likelihood of the quadrupole power l(l+1)C2/2π in µK2 from WMAP. 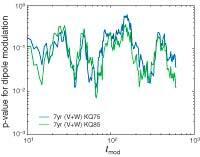 The WMAP ILC data were smoothed to 5° and the KQ85y7 mask was used, both degraded to res 5. The Gibbs sam pling produced a likelihood that has been marginalized over all other multipoles. 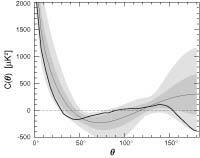 The highly non-Gaussian likelihood distribution is characteristic of the lowest-l multipoles. For l > 32 the curves become nearly Gaussian. 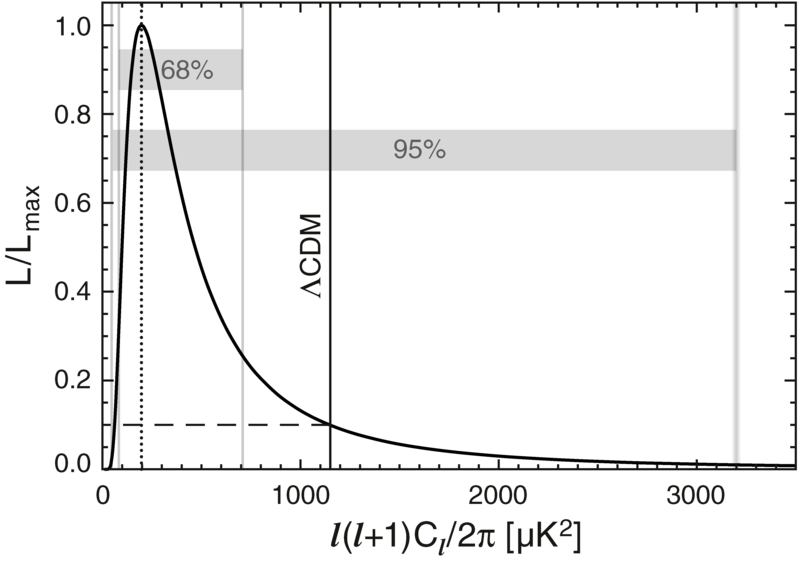 The vertical line with the label “ΛCDM” is the expected quadrupole from the full power spectrum ΛCDM model best-fit to the WMAP data. 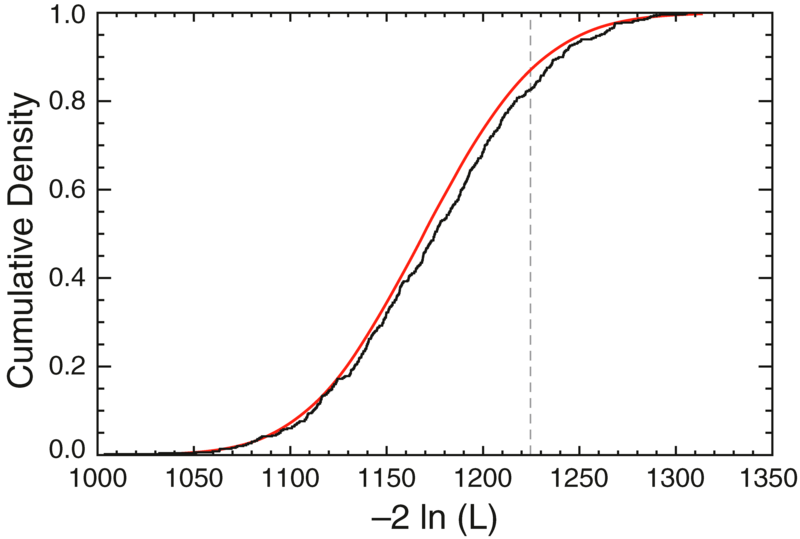 The maximum likelihood of the WMAP measured l = 2 quadrupole is at the vertical dotted line. These two values are consistent to well within the 95% confidence region. The WMAP quadrupole is not anomalously low. The cumulative distribution function of the quadrupoles from the Gibbs sampling based on 300,000 points. The vertical line is the predicted ΛCDM model quadrupole value. The cumulative probability is 0.824 where the vertical line crosses the cumulative distribution function . Since the expected quadrupole from the ΛCDM model is well within the 95% confidence range of the measured quadrupole, accounting for noise and cosmic vari ance, we conclude that the measured quadrupole is not anomalously low. The angular correlation function of the full sky WMAP ILC map is shown (heavy black curve). For comparison, the angular correlation function for the best fit ΛCDM model is also shown (thin black curve), along with the associated 68% and 95% confidence ranges, as determined by Monte Carlo simulations. The angular correlation function of the full sky map is seen to be within the 95% confidence range of the best fit ΛCDM model. This angular correlation function was computed from the Cl power spectrum, but is nearly indistinguishable from a pixel pair computation. Either way, there is no evidence of a lack of large-scale power. 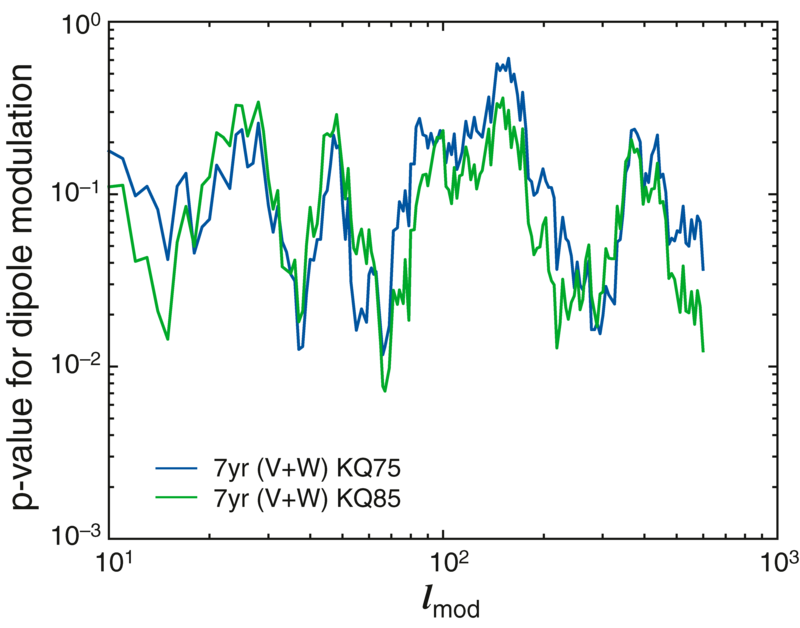 (a) The Χ2 per degree of freedom of the 7 year temperature-temperature power spectrum data relative to the best fit ΛCDM model. 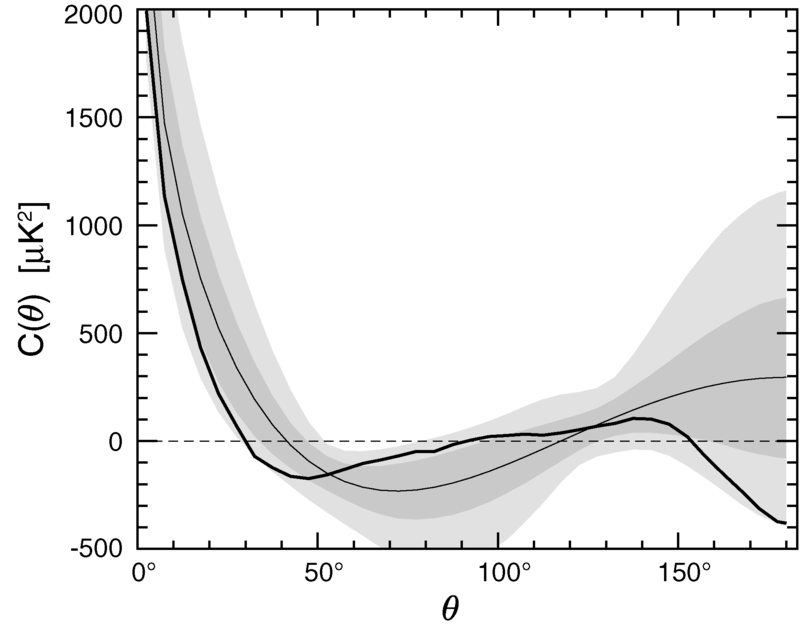 Light gray points are from 50 simulations that used the same ΛCDM model with the appropriate noise and cosmic variance included, where the error bars are driven by the number of simulations. The data and simulations were run through the same data analysis pipeline. These simulations were used to help fit the effective fraction of the sky, fsky to use for the data analysis. (b) The Χ2 per degree of freedom is compared for the 3-year, 5-year, and 7-year maps. Small differences in the fit model have a negligible effect on these plots. 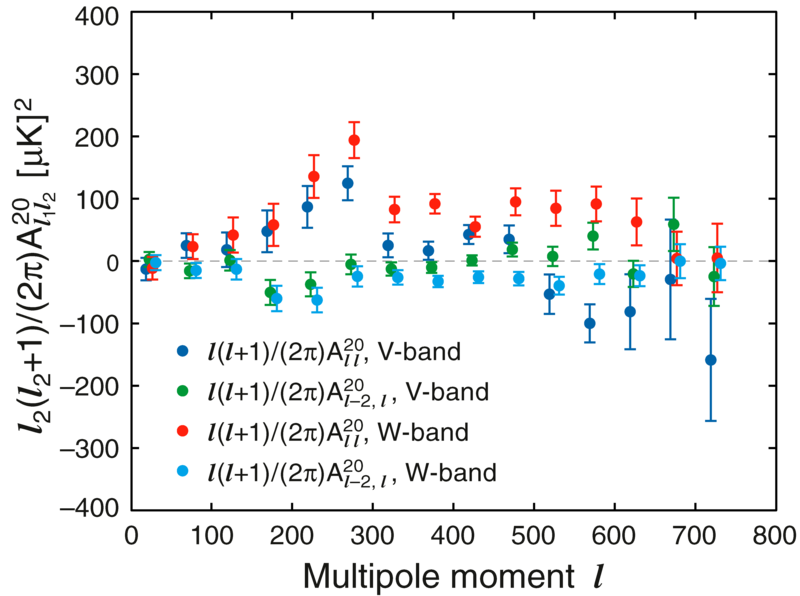 The Χ2 per degree of freedom for l ≈ 300 has been slightly growing with additional data, while other multipole moment ranges are more random with additional data. (c) The Χ2 per degree of freedom had the same WMAP data been taken in a reverse time order. The l < 400 region appears robust, while the Χ2 variations for l > 400 appear more random. (d) Variation of Χ2 with the choice of Galactic foreground mask appears random for l > 400. The black curve is the cumulative probability of the WMAP temperature data based on 499 simulations. All of the simulations were drawn from the same ΛCDM model, but Χ2 was evaluated with respect to the best-fit model for each realization. Of these, 412 (82.6%) had a lower Χ2 than the vertical line at 1224.6. Thus, the WMAP power spectrum is statistically compatible with the model. 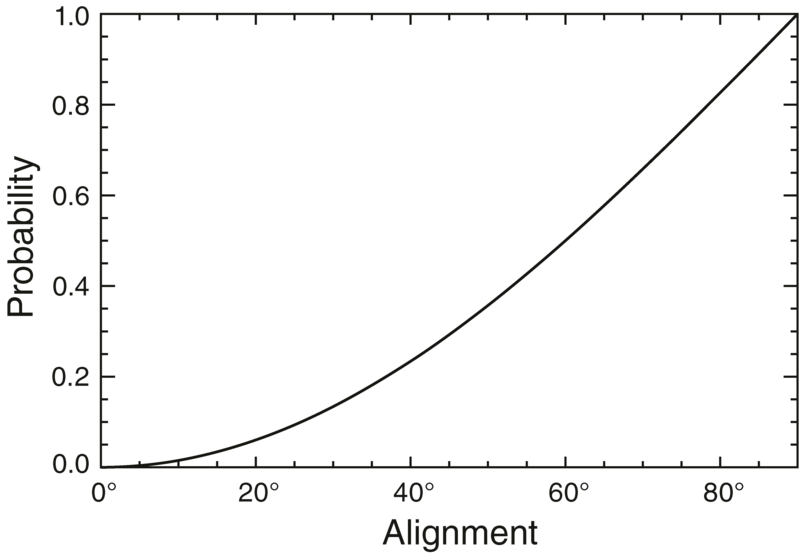 The red curve is a Χ2 distribution with 1170 degrees of freedom, shown for comparison. We compute Δl = l - l' correlation properties of Cl for nearby multipoles for the WMAP data (blue) and comparable simulations (red). For the most part the data and simulations are in good agreement. The most discrepant correlations in Cl are for Δl = 1 near l ~ 320 and Δl ~ 2 near l ~ 280. 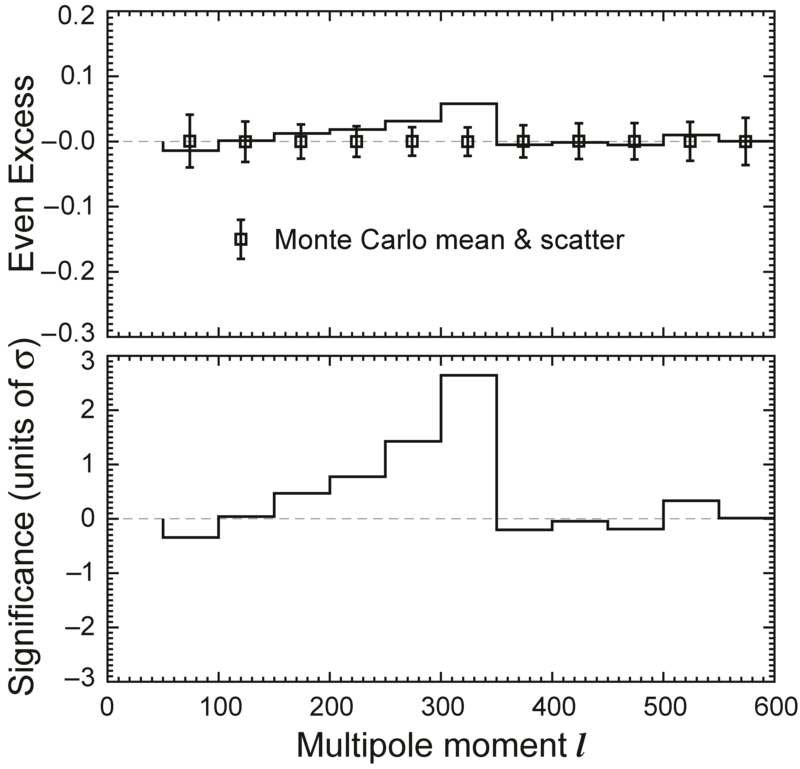 Top: Even excess El in the observed power spectrum, in bins of Δl = 50, compared to the mean and scatter from 11436 Monte Carlo realizations. 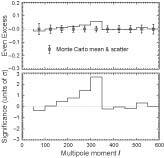 Bottom: El as in the top plot, converted to significance units by normalizing to the Monte Carlo scatter in each bin. Only the l = 250 - 299 and l = 300 - 349 bins show a significance greater than 1σ. 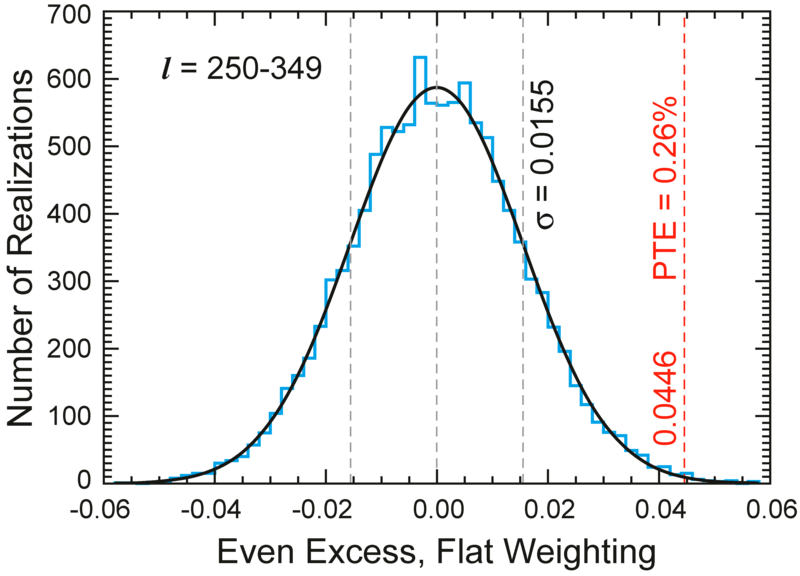 Even excess El in the observed power spectrum, in the l range 250 - 349, compared to a histogram of the same value as computed from 11436 Monte Carlo realizations. The probability for a random realization to exceed the observed value (PTE) is 0.26%, interpolated directly from the Monte Carlo cumulative distribution. A Gaussian with the same area and standard deviation as the histogram is over-plotted, with ±1σ indications. 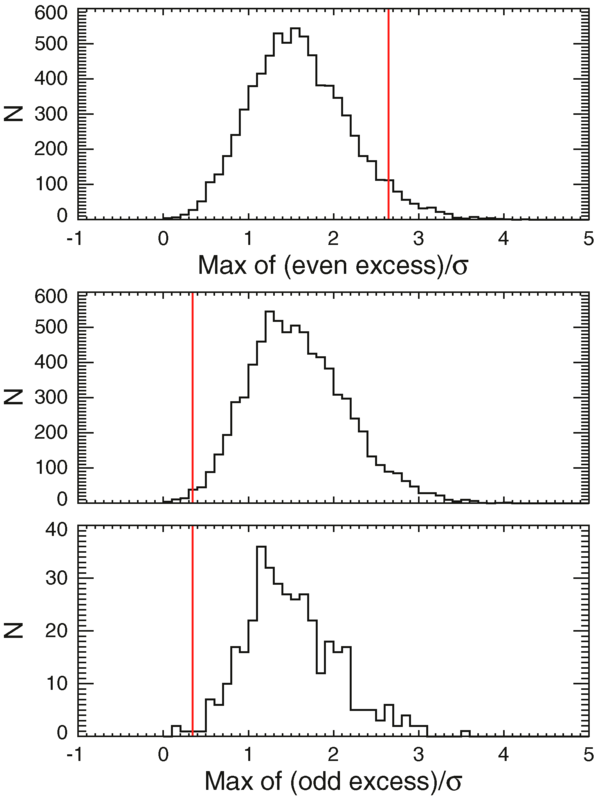 Top: Histogram of max (El/σ(El)) for each Monte Carlo realization. The maximum is taken over 11 bins of Δl = 50, for l = 50 - 599. The red vertical line is the observed value of 2.65, with a probability to exceed of 5.11%. Middle: Histogram of max(-El/σ(El)), which is the greatest significance found in any l bin having an odd excess. 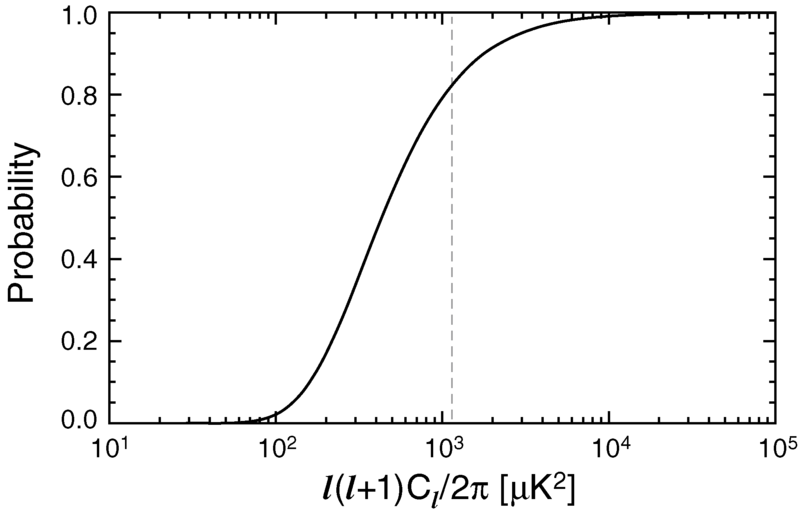 Although the histograms are not normal distributions, the observed maximum even excess is equivalent to a ~ 1.6σ result, and the observed maximum odd excess of 0.34 at the vertical red line is equivalent to a ~ 2.5σ result. 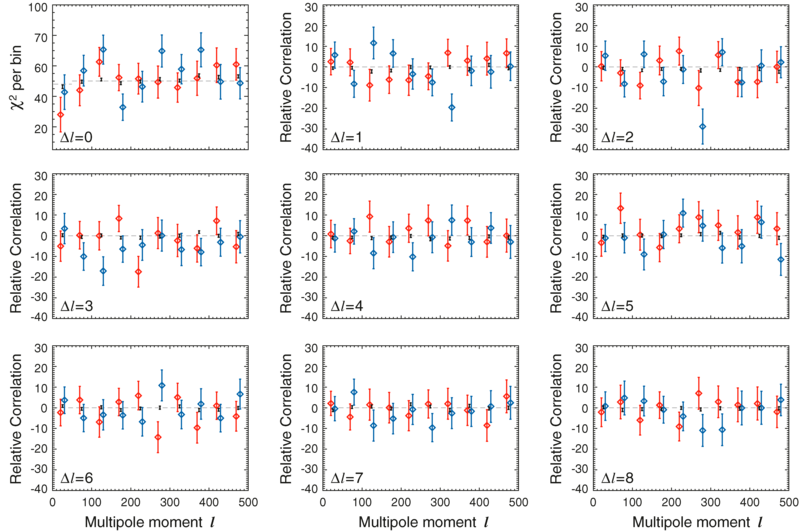 Bottom: The histogram is the same as the one above, but restricted to a pre-selection of the simulations where the maximum of the significance of the even excess is greater than or equal to the observed even excess. The probability of a greater quadrupole-octupole alignment is given as a function of the alignment angle, in degrees. The probability given here does not account for the a posteriori selection of a multipole alignment search, nor does it take into account the choice of the quadrupole and the octupole moments in particular. 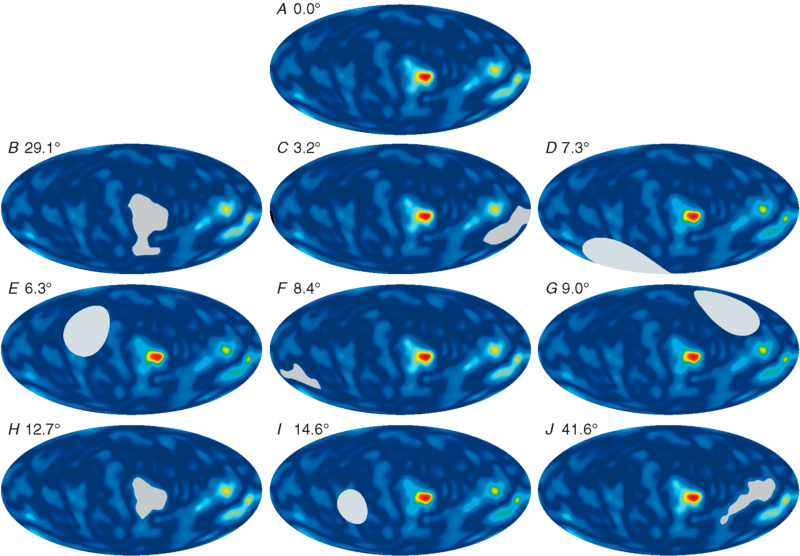 We smooth and square the ILC map, as described in the text, to make a map of (ΔT)2 to roughly visualize the anisotropy power in a sky map (A). Cold Spot I is the highest power region at this level of resolution, but several other regions also contribute substantial power at this scale. For map (A), the quadrupole and octupole are aligned to within ~ 1°. 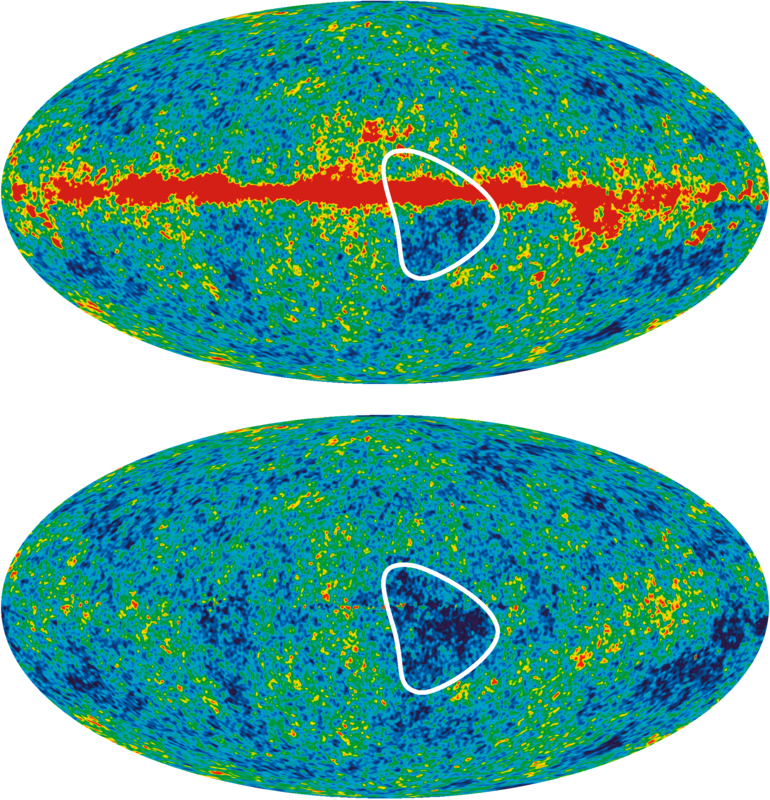 To evaluate what regions contribute to this alignment, we mask selected gray areas as shown in the sky maps (B) through (J). Each map is labeled by the degree of quadrupole-octupole alignment remaining after the gray mask is applied. Masking Cold Spot I in (B) or (H) eliminates any significant alignment. However, keeping those regions and masking other regions, also breaks the alignment to a significant degree. We conclude that no single region or pair of regions generates the alignment. Rather the combination of power from a substantial fraction of the full sky map combine to cause the high degree of quadrupole-octupole alignment. 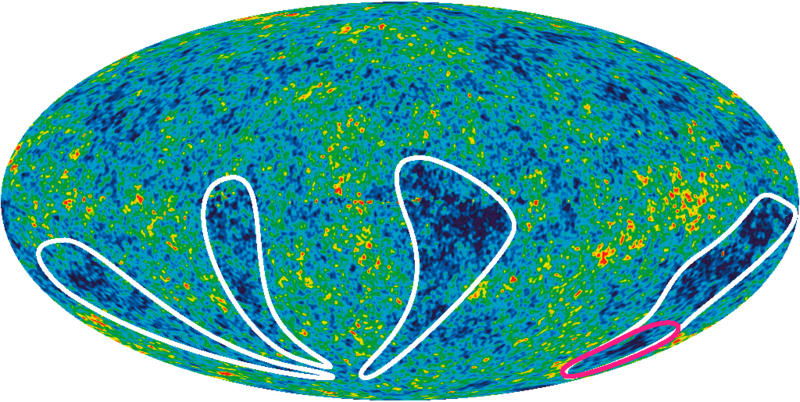 Note that the chance alignment of CMB power with the Galactic cut region discussed in §5 is apparent in map (A). The l = 2 quadrupole map and l = 3 octupole map are added. The combined map is then shown superposed on the ILC map from Figure 2. Note that the quadrupole and octupole components arrange themselves to match the cool fingers and the warm regions in between. The fingers and the alignment of the l = 2 and l = 3 multipoles are intimately connected. The probability for a Monte Carlo simulation to have a larger dipole modulation than the co-added V+W WMAP data, as measured by the statistic κ1, is shown as a function of the maximum multipole moment lmod that is assumed to be modulated. This can be interpreted as the statistical significance of power asymmetry for a fixed value of lmod, if one does not account for possible a posteriori bias when chosing lmod. The quadrupolar bipolar power spectra, binned with Δl = 50, is shown separately for V-band and W-band WMAP data, using the KQ75y7 mask. Only the components of the bipolar power spectra that point along the ecliptic axis are shown (i.e. components with M = 0 in ecliptic coordinates). A statistically significant quadrupolar effect is seen, even for a single frequency band in a single angular bin. 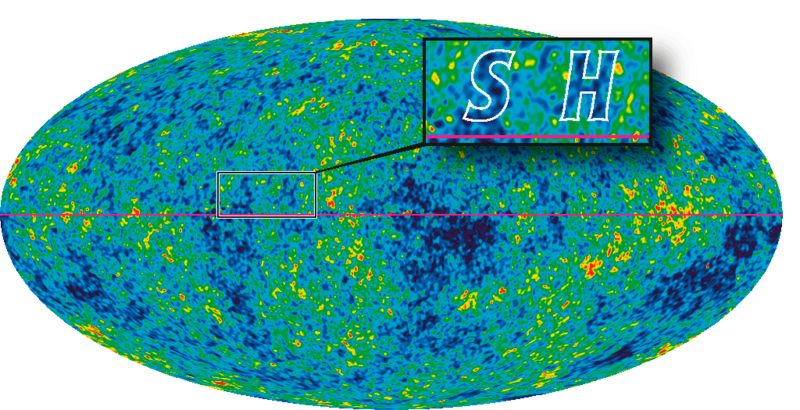 The “SH” initials of Stephen Hawking are shown in the ILC sky map. The “S” and “H” are in roughly the same font size and style, and both letters are aligned neatly along a line of fixed Galactic latitude. A calculation would show that the probability of this particular occurrence is vanishingly small. Yet, there is no case to made for a non-standard cosmology despite this extraordinarily low probability event. It is clear that the combined selection of looking for initials, these particular initials, and their alignment and location are all a posteriori choices. For a rich data set, as is the case with WMAP , there are a lot of data and a lot of ways of analyzing the data. Low probability events are guaranteed to occur. The a posteriori assignment of a likelihood for a particular event detected, especially when the detection of that event is “optimized” for maximum effect by analysis choices, does not result in a fair unbiased assessment. This is a recurrent issue with CMB data analysis, and is often a tricky issue and one that is difficult to overcome.